One of two major boating rivers (the Shrewsbury is the other) on the Upper New Jersey Coast, the Navesink River is located off the Shrewsbury River about seven miles south of Sandy Hook Point and 20 miles north of the Shark River. 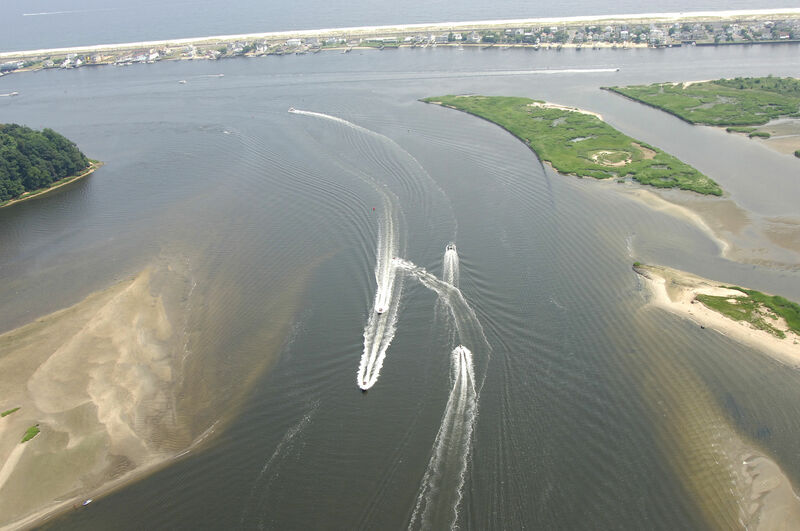 Inside the River at the towns of Rumson, Fair Haven, and Red Bank are a selection of 11 marinas and marine service locations with a wide-ranging variety of services. The image above is a view from the west looking east over the opening of the Navesink River where it empties into the Shrewsbury River at Highlands Reach. (Highlands Reach can be seen running from left to right in the upper portion of the image above.) 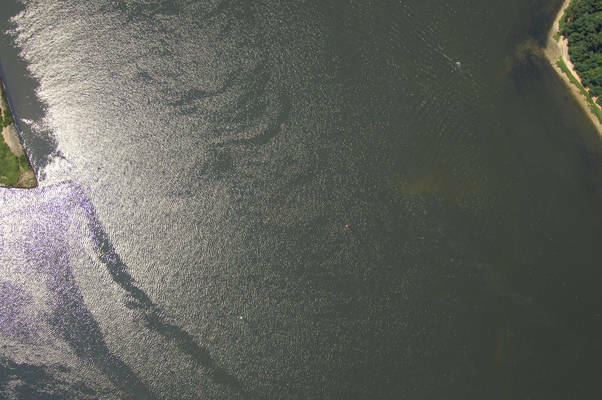 Off to the upper left (north) portion of the image is tree-covered Lower Rock Point, while in the top (east) portion of the image is the town of Sea Bright with the Atlantic Ocean beyond. 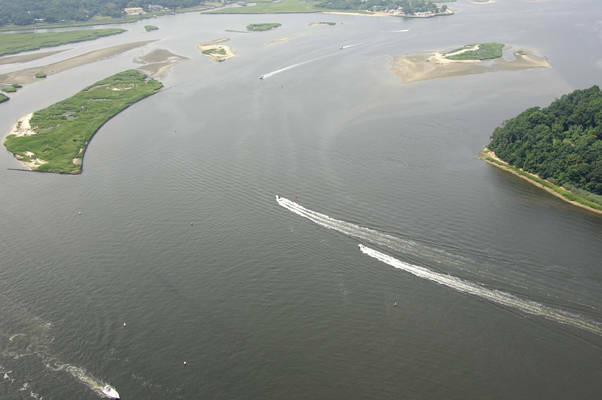 There are a few things to keep in mind when transiting the Navesink River. First, pay meticulous attention to the markers at the inlet where the Navesink meets the Shrewsbury River. There are fairly steep shoals on either side of the channel. Additionally, keep in mind that the tidal current can be quite swift here and will require some close attention when you are entering the river. 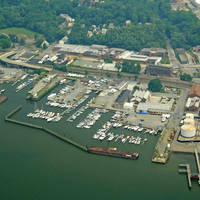 The Navesink River is reached from the Shrewsbury River via a passage that starts at Lower Rock Point. From Lower Rock Point, first set a course to intercept green can 1, which is located about one-tenth of a mile east of the point. Once you have successfully picked up green can 1,start into the river and follow green nun 3, red nun 4, flashing green buoy 5, red nun buoy 6, and then flashing red buoy 8 and red nun 10 farther in. The Oceanic Bascule Bridge crosses the Navesink River at Locust Point and has a closed vertical clearance of 22 feet. Call ahead on VHF Channel 13 for opening schedules and restricted times before making your passage farther upstream. 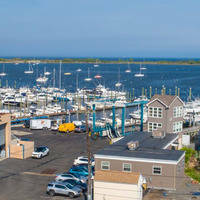 Marinas facilities are located in the towns of Rumson, Fair Haven and Red Bank. Rumson is east of the bascule bridge, while Fair Haven and Red Bank are to the west of the bridge. No reviews yet! 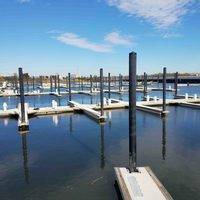 Be the first to write a review of Navesink River Inlet.